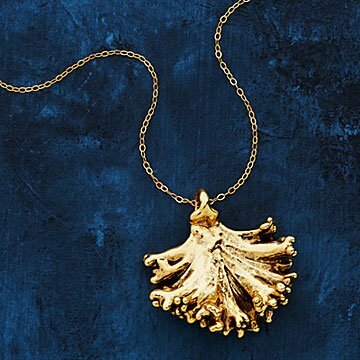 This kale leaf dipped in 24k antique gold turns a whimsical idea into a gorgeous accessory. Kale salad, kale chips, kale smoothie, and gold-dipped kale? It might be the only form you've never tried. Even though it's not going to boost your health, this handmade pendant will give your outfit a beautiful upgrade. Inspired by the popular leafy green, designer Michale Dancer decided to try covering a real kale leaf in 24-karat antique gold. The result exceeded her whimsical expectations, and the necklace turned into something much more elegant. Handmade in California. Handle with care, clean with dry cloth.